I try to play Super Mario Bros. 2 every spring. 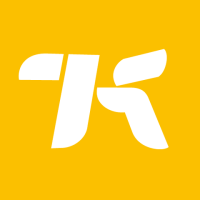 The game’s bright colors, whimsical level design, and obsession with weeding make it feel right at home around the time of the the vernal equinox, and it’s also one of the easiest to pick up and play. It’s not as challenging as the original Super Mario Bros. but not as long and involved as Super Mario Bros. 3. Dipping back in over the weekend, I remembered all over again why it’s one of my favorites. Any time anyone talks about Super Mario Bros. 2, there’s a bit of baggage that needs to be dealt with at the start. No, it wasn’t a true Super Mario Bros. game. Japan’s Super Mario Bros. 2 is actually a straight continuation of the first game (which later came to the West as the “Lost Levels” add-on to the SNES’s Super Mario Bros. All-Stars). Super Mario Bros. 2 in North America was actually a re-skinned version of Doki Doki Panic, albeit one that was so popular most players didn’t know any better and which was eventually ported back to Japan as Super Mario Bros. USA. It’s not hard to see why. The very first level is mind-bending for anyone who played the original game. First, you can choose between four characters—Mario, Luigi, Toad, and Peach—each of whom platforms a little differently and can pick things up at different speeds. Level 1-1 opens on the top of a tall, green hill, but instead of going to the right you drop straight down, literally the last thing you ever wanted to do in the previous game. A Shy Guy is wandering around this beginning area, but if you try to jump on its head you just land there and nothing happens. Instead you might try pressing B, leading you to pick up the Shy Guy and throw it. There’s also a turnip you can pull out of the ground, before going to the bottom of the area and opening a door to the next. Even replaying it decades later, it’s hard not to appreciate how, in only a few seconds, one sequel could subvert all the rules of its predecessor. Even now I still feel incredibly liberated any time I play the game, and in many ways simply calling Super Mario Bros. 2 a Doki Doki Panic re-skin feels inadequate. What the game has brought to the series is just too good and too important. 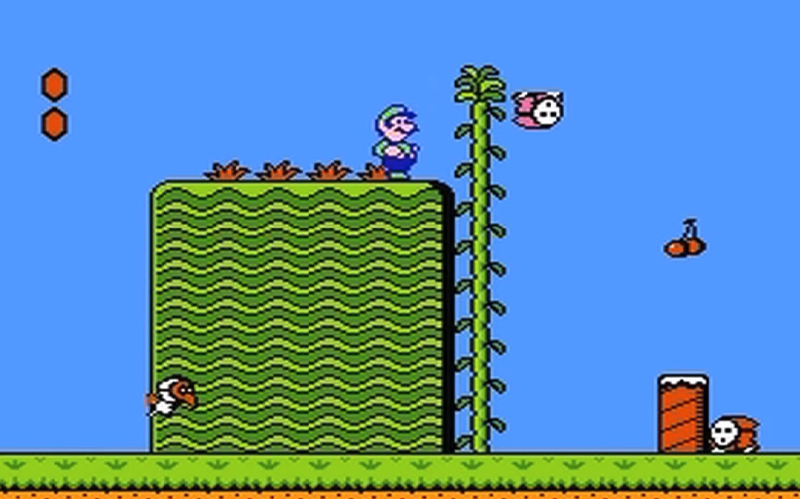 Halfway through the first level you climb up a vine next to a waterfall. 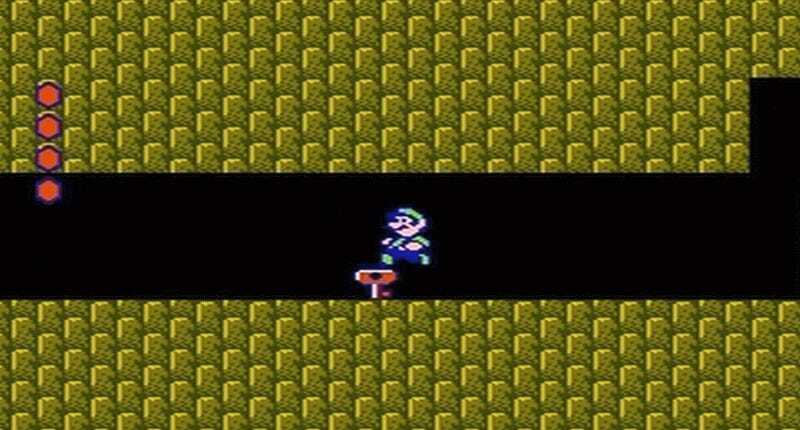 My instinct in Super Mario Bros. games is still, to this day, to go right. But if you walk left after climbing that vine, you’ll discover Super Mario Bros. 2’s first big secret, one that rewards you for ignoring your instincts. It lets you skip half the level and go straight to the boss, Birdo. Entire Mario games are now built on tricks like these, and it’s fair to say the trend started with Super Mario Bros. 2. One of my earliest video game memories is watching my brother and his friend play Super Mario Bros. 2 on a small CRT in the corner of our living room. It was Easter, and I was eating chocolate eggs. My brother’s friend had a pack of Big League Chew. All of us were entranced as my brother searched through dozens of vases for a key to unlock the door on world 6-1. When he finally found it (the fifth to last one), it was a eureka moment, followed abruptly by the terror of knowing he had to get it back to the door while a flying mask (Phanto) tried to kill him. Phanto breaks another cardinal Mario rule of the time: that enemies don’t follow you from one screen to the next. What happens behind a door or down in a vase is supposed to stay there, but Phanto can follow you across an entire level. Nothing’s worse than mistiming a jump and getting killed by him steps away from the locked door you were trying to bring his key to. Even to this day, he sends a chill down my spine. He’s deadly and near impossible to kill, but more than anything else, he’s a reminder that the game is always one step ahead of me.